In no particular order here are some of the shots I took of this year's marathon. I was worried that none of them would come out since my skills aren't so speedy but I did OK. 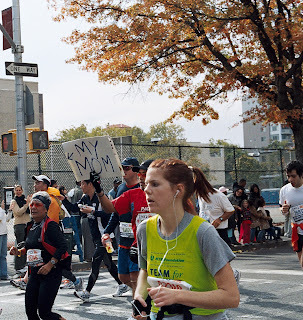 The sign that woman is holding says, "Run Your Own Race," which I thought was perfect. 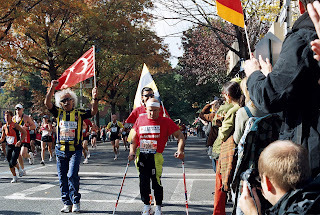 This Turkish gentleman "runs" the race every year. His upper body is not to be believed. His friend on the left there is with him every year, too. I wish I could have gotten more faces of the marathon. A lot of people are grinning and goofing (I'm looking at you, Logan Summers) and some people are gritting it out and others are somewhere in between. I wasn't confident enough to try a lot of these shots but I might be next time given how this one worked. We give great spectation in my neighborhood. 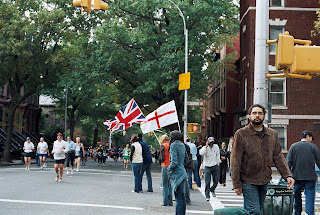 These people cheering the Brits and the Swiss were down the block from where I spent most of my time. Behind me I had a Danish contingent and let me tell you there were a lot of Danish runners and almost every single one of them was highly appreciative of the support. How does something like this not just bring tears to your eyes? It did when I took the shot and it does now. When I tell you it's a miracle that I got a clear shot of these professional men I am not exaggerating even a little. They are running an average of 5 minutes per mile for the entire race. If you find that difficult to picture I can only help by saying that, truly, if you blink you miss them entirely. 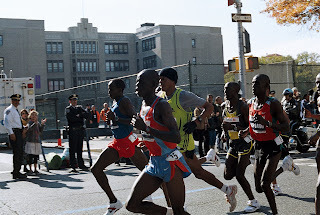 Look at the length of the stride on that dude in the yellow, he's just eating up the pavement. 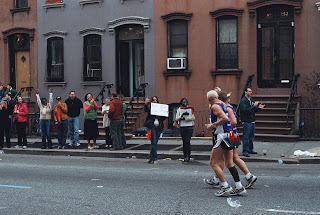 This is the only shot I have of Paula Radcliffe (Click to enlarge and you might be able to see her better). I didn't realize she was running and there's no time to process who the runner is and then decide to take a picture and take the picture before she's long gone. It may be hard to make out here but there's one woman just behind her and the rest of the pro women aren't even in sight yet. It took them minutes to arrive. I know I've been harping on this here and there but has anyone found pictures of Katie Holmes anywhere but the finish of the race? 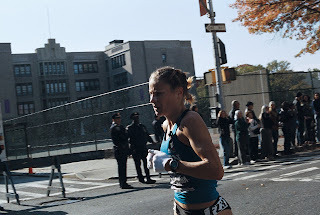 I haven't seen any photos of her along the route, just at the finish line. Seems...odd, you know? Now that's cool! I love the "mom" sign. How amazingly wonderful! For some reason, I love the notion that Katie Holmes cheated and only ran the last bit. It probably stems from my hatred of Tom Cruise. I'll have to work on that. Wonderful pictures! It's possible I just don't pay attention, but do you actually live in NYC? Yes, Contrary, I've lived in New York for 20 years not counting brief stints for grad school and work. 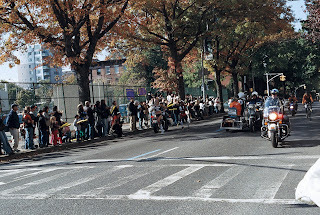 I live in Brooklyn and there's a fabulous place to watch the marathon just a couple of blocks from my house. A Good Time Was Had By Me! Run [insert name here] Run! How About That Time Change, eh?